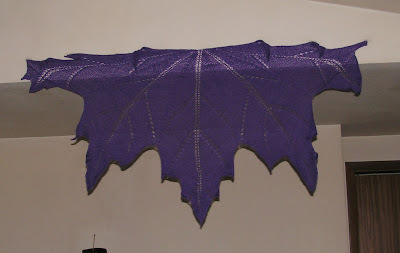 I've finished knitting my Maple Leaf. It wasn't a difficult pattern - mostly stockinette. 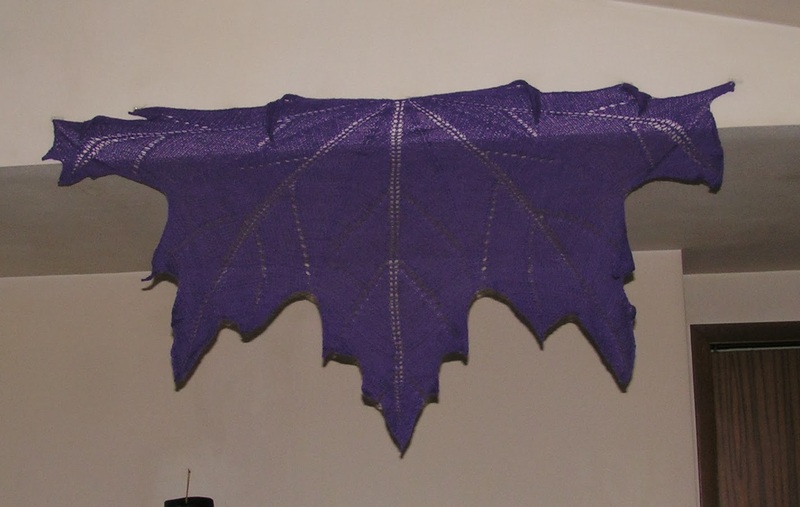 I did have a bit of a problem shaping it right so it's not exactly like the pattern picture. In fact, both Kerry and Eric think it looks like a big pot leaf. Silly boys! It's hanging from my ceiling because I couldn't find a good place to lay it out without the help of a certain little furry friend. Wearing it may be a challenge. It will be warm, though, since it's alpaca. I was hit by a blow yesterday. I love plants. I have lots of them around the house - it drives everyone else crazy. Most of them have been with me for a long time. One of my favorites is a dwarf banana tree. I bought her when she was about three inches tall about eleven years ago. She grew to six feet tall and loaded with lush leaves - she was magnificent. She died yesterday. I had her out on the porch all last summer and she loved it. When I brought her in for the winter she wilted. Her last leaf broke yesterday afternoon. I'm crushed. It's probably silly to be upset about a plant, but I can't help it. I wish I had a picture to share. Maybe one of these days I'll find another one and can start again. Today, though, I'm looking at the empty space and missing her. The title of today's post comes from Firefly. It's a great show. I've watched it several times. I recently started watching Farscape. It's gorgeous. Discovering treasures is one reason why I love Netflix. Ooo pretty! Do you have a link to the pattern?